Only a month left in the launch of AMD’s Bulldozer based Zambezi-FX CPU’s and we are already receiving tons of new details and leaks on the AM3+ based platform. Well, Today we’ve got another leak by the top motherboard manufacturer “Asus” which has detailed the specifications of upcoming FX series processors through its “AM3+ Motherboards BIOS Evaluation” Chart. Asus’s upcoming 990FX based sabertooth motherboard was also pictured a while ago which you can see here. The chart details 4 upcoming Zambezi-FX series processors which were already reported in the leaked pricing chart here. The chart details Core Clock, Core Count, Max TDP and Turbo Core boost frequency. The clock frequencies were erased. Fortunately, The source reports that it still managed to get the frequencies details on two FX-based CPU’s which include FX-8130P and FX 8110. 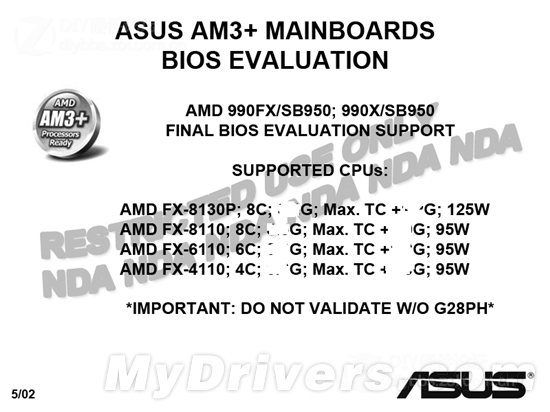 We already reported performance details of AMD FX-8110 here and FX-4110 here. From the looks of it, The FX-8130P will be the FX-series top offering featuring a core clock of 3.8Ghz and a Turbo Core speed of 4.2Ghz, Keep in mind that this is a 8-Core CPU and will be priced for 320$ against the FX 8110’s 290$ price which is also a 8 Core variant but features lesser core frequency of 3.6Ghz and 4.0Ghz (Turbo Core). A Turbo Core speed of 4.0Ghz + is quite amazing considering the Intel’s 310$ (i7 2600K) which comes with a core clock of 3.4Ghz with turbo boost of 3.8Ghz. Prices taken from here. The AMD Bulldozer platform is currently scheduled for launch on E3 2011 event in L.A, Though not official and Computex 2011 launch is also likely.